My brother and his wife from Ohio just called. They are coming to visit. 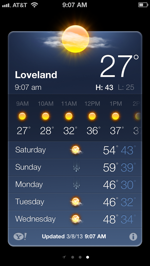 Yes, but look at Loveland’s high for Saturday; it’s not much warmer than that right now where we are. 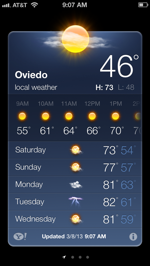 I speak as one who DOES NOT like out current low temps. But have fun w/ your guests. Will you be taking them to the beach? No beach. Don’t think they are beach people! Ha – I did the reverse when I headed to Dayton right after Christmas to visit Sarah Kaye. SNOW-POCALYPSE!! well – it was for me. I mean there were snow plows and everything. At one point Sarah did mutter that I was a “green” but I had fun! I wouldn’t mind visiting snow-pocalypse (or the recent snow-quester) but I’m kinda glad that I live somewhere people come from out of town to visit. Speaking of which….